Did you take the ice bucket challenge to support ALS? If so, you found out that a bucket of cold water can hurt so good! At the height of ice bucket madness, 4.4 million tweets contained #icebucketchallenge, $88.5M in donations were made to ALS and everyone from Jimmy Fallon to Bill Gates to Taylor Swift were posting ice bucket videos. But, as Scott Nelson and his team at Viber went on to prove, there were many ways to keep the support of ALS going long after the water dried. Many of our resolutions for the New Year include helping others on a personal level, but what about on a corporate level? How can we use our own corporate brand to empower worthy causes? What steps must be taken, both internally and externally, to truly make a difference? Last August, Nelson, head of Viber in North America, took the ice bucket challenge with his three young sons. They then challenged their cousins, who happily agreed. Back at the office, Nelson and his team knew that Viber's core competencies made them uniquely suited to keep the public connected with ALS.net's mission, both during ice bucket madness and beyond. Viber is one of the world's leading mobile messaging apps, with almost 700 million users in 193 countries. Only one year after the start of the Viber x ALS partnership, Viber's ALS TDI (Therapy Development Institute) Ice Bucket Challenge Public Chat has over 1.6 million followers and their Sticker Pack is now one of the most popular packs on the Viber platform. In the first 30 days, the ALS Viber Sticker Pack was downloaded 2 million times and used/shared within the Viber app over 5 million times. Overall, the ALS Viber Sticker Pack has been downloaded over 3 million times and used/shared over 10 million times, keeping the ALS story on everyone's lips (or fingertips) on a daily basis. 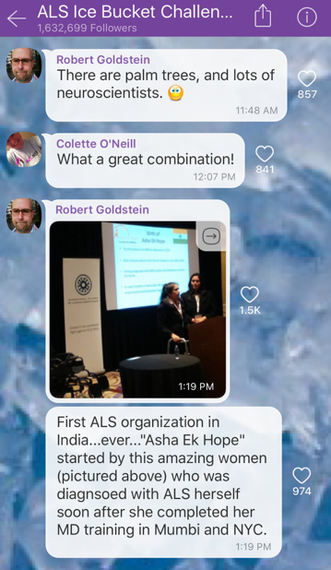 I attended the ALS White Coat Affair in November 2015 (which was sponsored in part by Viber) and was blown away to learn how Viber has harnessed their platform not only to sustain the ice bucket challenge excitement, but also to keep people educated about the struggles of those with ALS, keeping them informed about scientific findings, and, most importantly, inviting the public into the quest to find a cure. I sat down with Scott to learn more about how Viber brought so much focus to ALS both internally at Viber and externally in the world. How do businesses go beyond soliciting donations and actually prompt others to take real action? The short answer is that it's much easier when the initiative aligns with your mission, passion and expertise. As a performance management consultant and business owner, I love hearing stories about why and how companies were conceived. In 2010, Talmon Marco (now CEO of Viber) needed a free way to keep in touch with his girlfriend while she traveled abroad. So, he created an instant messaging / VoIP app so they could stay connected. Thus, Viber was born. Viber's tagline is "Connect. Freely." and is at the heart of everything they do. All brand positioning is centered on "going out into the world on a daily basis and making sure we're spreading good vibes," explains Nelson. A great way to spread good vibes is to enable and empower worthy organizations like ALS.net. Prior to Nelson's arrival in early 2015 to the newly created role of Viber's North American head, the organization did not have an office in the US. Their 300+ employees are now located across the world, in the North America, London, Tel Aviv, Japan, Russia, Belarus, Luxembourg and the Philippines. How do employees of an international messaging company communicate? Via chat groups, of course. Nelson describes, "We use two internal group chats (dubbed "Purple Group" and "Chat Moments") which are external facing [Public Chats], meaning people around the world can follow them. We have employees all around the world utilizing these two group chats to talk about what's going on in their office, whatever they're doing from a marketing standpoint, what's going on with the business in their region, etc. It's a constant chat amongst over 300 employees worldwide." Viber also offers "sticker packs" as another form of expression and emotion. In the beginning stages of the ALS.net partnership, Viber employees merely used their Public Chats (which are visible to all Viber users) to discuss how the company, as a whole, could help support this cause. "Not only had every employee in Viber seen [the plan to support ALS] but users around the world could follow what we're talking about. The purple chat group has over 12 million followers, the other chat [Chat Moments] has over 3 million followers" explains Nelson. From this point, the Viber x ALS partnership was crystallized, formally beginning with the launch of an ALS Public Chat and a customized Viber Sticker Pack. "It's really allowed us to give a voice, or rather a place, in a very popular communication app for people with ALS to reach out, tell their story worldwide. 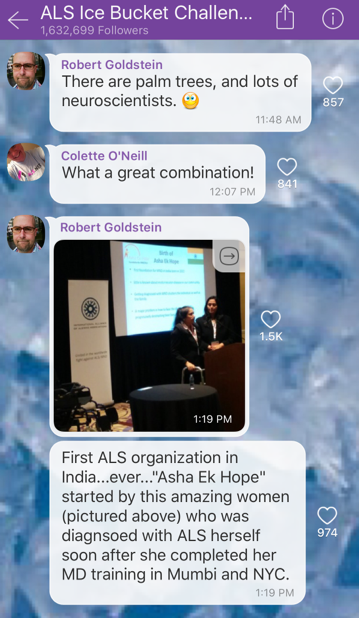 People really genuinely want to help other people and I think the public chat on Viber allowed a way for people with ALS to connect with people who want to help," says Rob Goldstein, Vice President of Marketing, Communications and Development at ALS.net. Users drive engagement through their own workplaces, with colleagues, friends and family following the conversation and subsequently becoming informed. In my consulting role at Acolyst, I often help clients enhance the awareness of their brands in the marketplace. The steps to execute a successful brand awareness initiative share much in common with those of a charity partnership. So how can organizations learn from Viber's success when launching an awareness initiative? Pick a cause aligned with the mission: Viber's tagline is "Connect. Freely." and their brand is to spread good vibes. The mission of ALS.net is to use awareness and funding to find a cure. "For us, this idea of spreading good vibes really makes sense. It's what our technology was created to do and it is what our technology allows for on a daily basis" says Nelson. Utilize internal resources: The ice bucket challenge was video based and spread via social networks. Viber's platform was a natural fit to continue the conversation, with upwards of 700 million users (most of whom are via mobile). "I think their platform is very unique. I think that made the opportunity to partner with them in this way unique," shares Goldstein. Also, Viber had begun to create sticker packs, which they then used to develop a special version for ALS. These were easy and quick to make and launch, and soon people taking the ice bucket challenge enhanced their experiences by adding ALS stickers to their video messages. Embrace transparency: Viber employees went to ALS TDI research facilities, met with researchers, and chatted with patients. They then discussed this, as a company, on their chats. Since their chats are visible to the public, the public was able to be a part of their commitment, merely by reading along. Be genuinely passionate: When Viber's ALS initiative first started, it originated from the North American office, as the ice bucket challenge was primarily US-based at the time. As Nelson shares, "The team in Russia or the team in China or the team in Philippines, were like, 'Okay, interesting.' They were all about supporting and really liked it and wanted to learn more but it wasn't like, "Oh, this is going to be a really big initiative for Viber." However, once they saw the passion for the initiative both in the US and around the world, they got caught up in the enthusiasm and started similar initiatives in their own regions of the world. Tell a story - The power of a platform that is based purely in the digital world lends itself to story-telling. ALS.net previously didn't have much of a mobile reach, so Viber really appealed to them. Part of the public chats include videos showing ongoing scientific research and also show first-hand just how difficult the life of a person with ALS can be. These visual representations are very powerful. Also, the universal ability of someone in Berlin to be able to use an ice bucket challenge sticker or someone in the Philippines using an "I just donated to ALS" sticker is unifying. Empower others, empower yourself - Symbiotic relationships are very important. What started as a mission to help the ALS society evolved into something that helped Viber as well. Viber helped bring continual attention to the plight of ALS, while ALS.net helped Viber unify behind a cause and increase its global brand awareness. Make it easy for others to join in - The thinking behind the ALS campaign was not overly complicated - utilize a public chat, create meaningful stickers, and provide purposeful content. Many initiatives fail when people don't feel that sense of connection immediately. The main point here is to keep it simple. Utilize effective content - Part of the Viber x ALS partnership centers on creation and repurposing of content. It is important to work together to ensure that the content included in the public chats in the form of videos, photos and texts is on point and engaging. Even when activities happen "offline", such as the White Coat Gala, videos and photos can help tell the story so that people who weren't in attendance feel included. We're barely into 2016, and there is so much that we can all do to help others, while also bettering ourselves. As ALS.net heads into the New Year, its goal is to continue "taking the plunge", with global affiliates aiming to raise over $12 million for research to find a cure. "That kick(ed) off January 1st with a couple of plunges into very cold ocean waters here in the US and we'll go all the way through to ... the international ALS meeting in Dublin, Ireland at the end of the year," shares Goldstein. Obviously, this is a very committed group of people dedicated to a very important cause, and Viber hopes to keep attention on them. To paraphrase Scott Nelson's words, great power comes with great responsibility. With over 700 million pairs of eyeballs on Viber, they feel the obligation to make it count. Find out what makes you great and use it to help others. Make 2016 the year that your company inspires the community to take action in a meaningful way. Valeh Nazemoff is international bestselling author of The Four Intelligences of the Business Mind, as well as a coach, business consultant, and co-owner of Acolyst. She is founder of the Communication Transformation Business Workshop.